If you’re in the market for a Bluetooth speaker, chances are you must have stumbled across a few offerings from Sony. 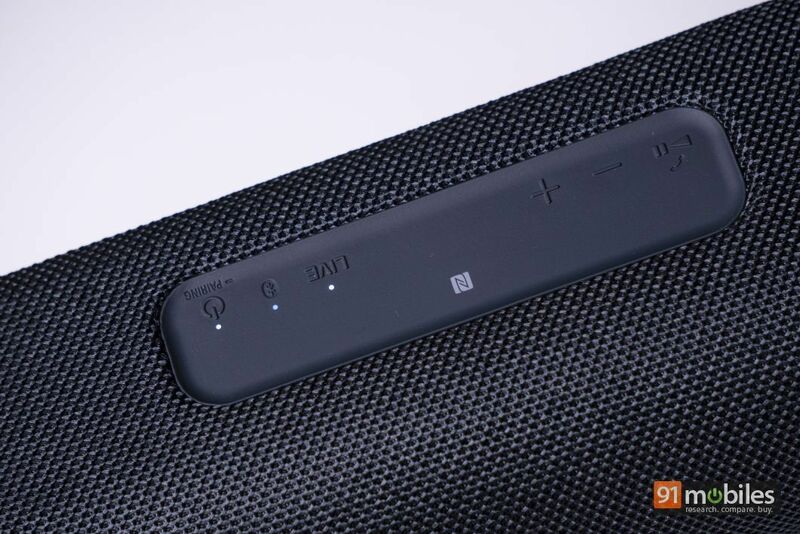 Over the years, the Japanese manufacturer has racked up quite a few audio products under its name and recently, the brand announced its flagship Bluetooth speaker for the year, namely the SRS-XB41. 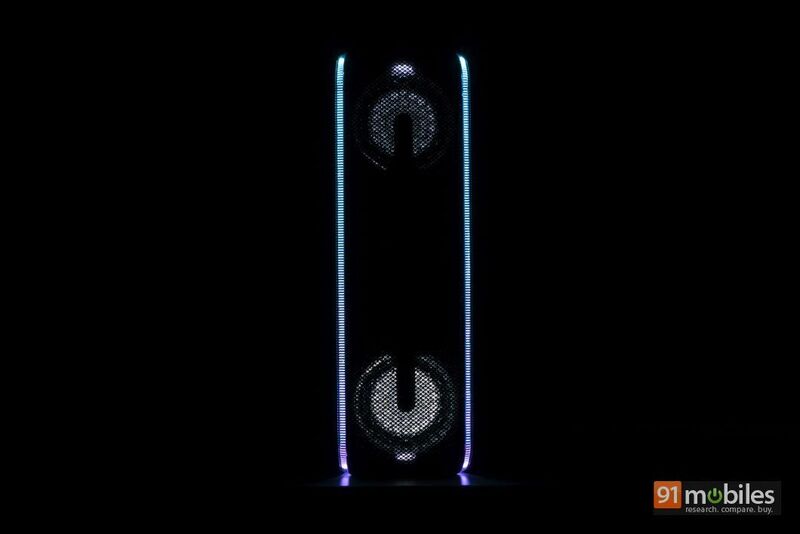 I’ve been reviewing a unit for a few weeks now and the speaker boasts quite a few party tricks (quite literally), which makes it an easy recommendation for anyone who has a budget of around Rs 15K. To know why, read on. 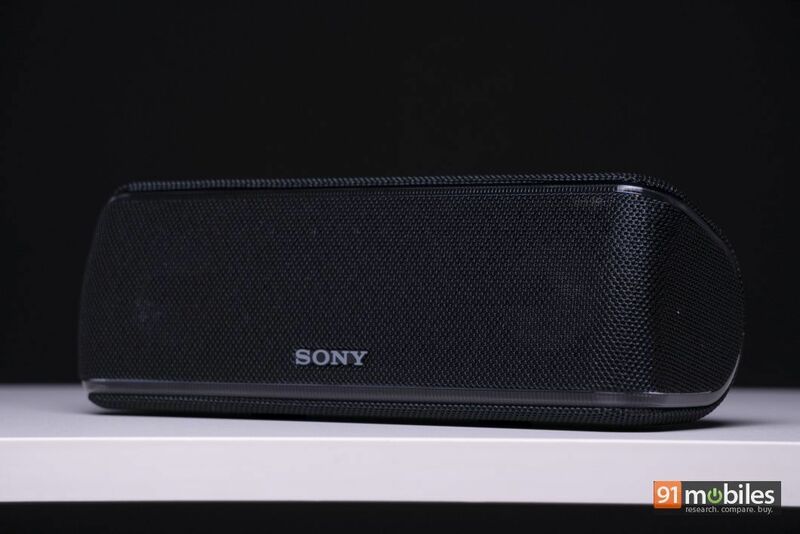 The Sony SRS-XB41 speaker is unlike anything you’ve ever seen. 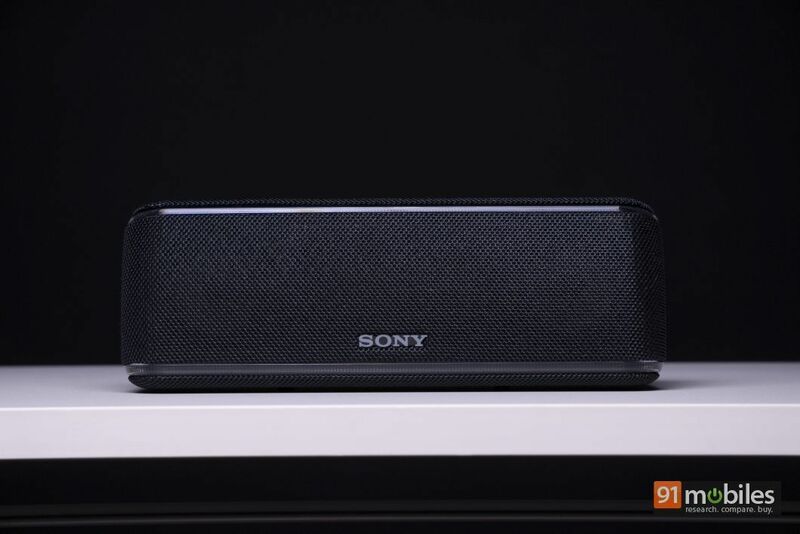 The design of the speaker is a testament to Sony’s excellent craftsmanship as the unit comes with enough bells and whistles which easily set it apart from the horde of other generic-looking Bluetooth speakers in the market. The speaker is attractive enough to be the soul of a party, and durable enough to withstand the aftermath of one too. Let me address the party features first. The Sony SRS-XB41 wants to be the showstopper at your parties which is why, the speaker comes decked with not one, not two, but three separate sets of LED modules. You’ll get a line light which covers the entire perimeter of the speaker, a speaker light which covers the 58mm drivers, and a flashing strobe light. 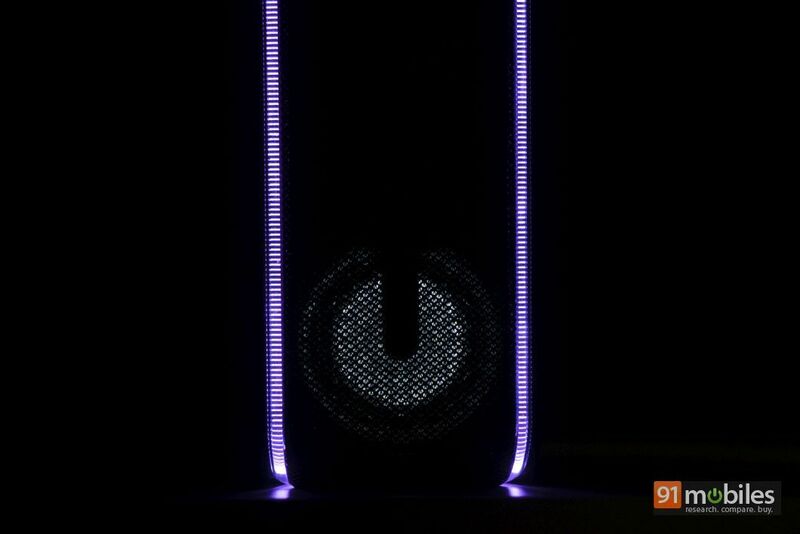 The LED lights also sync to the beats of a song, making your house the funkiest disco in the neighbourhood. Adding to the list of features, Sony also lets you control the colour of the LEDs via the Sony Music center app. The SRS-XB41 comes with a few more tricks up its sleeves which Sony advocates will take your party to the next level. 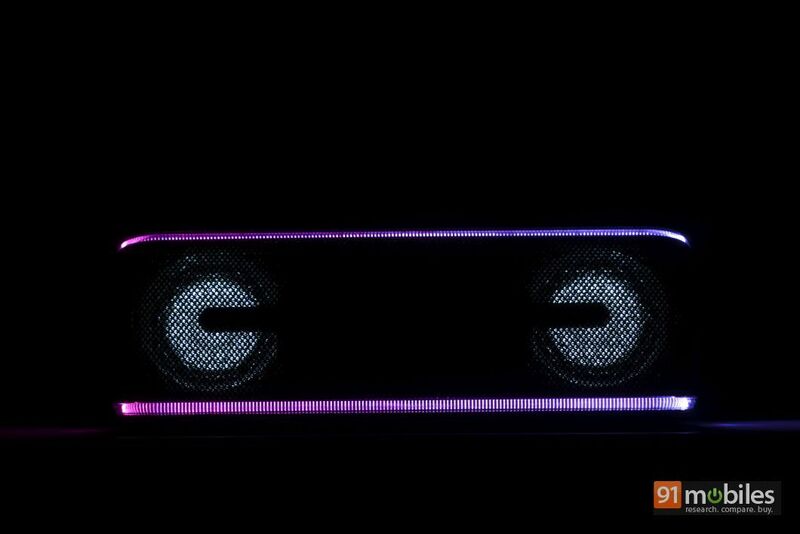 For instance, the speaker comes with ‘Party Booster’, which lets you tap on the surface of the unit and add various effects to a song, similar to what a DJ does. You can choose from a bunch of percussions such as drum sounds from the Sony Fiestable app and the harder you tap, the louder the sound effect would be. Now, if you’re into track-mixing, then you might find the ‘Party Booster’ feature useful. Others who don’t fancy lifting a 1.5 kg speaker and like to listen to songs as they were intended, would give this one a pass. Last but certainly not the least, the SRS-XB41 also comes with a Live Sound mode which theoretically, transports you to a live screening of your favourite artist. To do so, the company has utilised angular speakers on the SRS-XB41 which ‘‘make use of a new DSP technology to send your music to a wider area”. Now it works, and I did feel that the speakers were outputting sound at a much higher volume. However, the sound quality took a nasty hit and the bass was all but absent from the tracks. In summation, while I appreciate Sony’s commitment to giving users the best party experience, I feel that the company went a little overboard with some of the features which felt more gimmicky than functional. There are a lot of things to like about the design of the speaker, so let’s take a step back and talk about those. 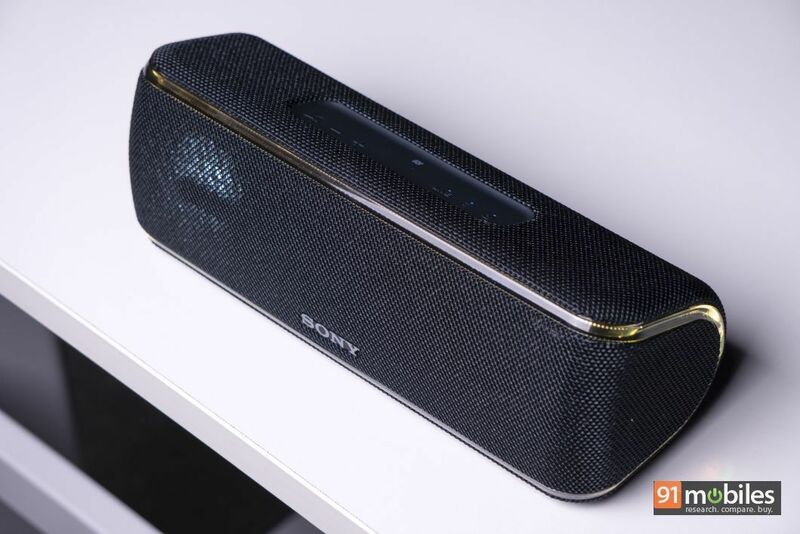 The Sony SRS-XB41 comes with a tightly-woven fabric finish which covers the entirety of the speaker, similar to what you might have seen on the Ultimate Ears Megaboom (review). Moreover, the speaker is dust- and water-proof too, as it comes with IP67 certification. Consequently, the speaker will come out unscathed should someone spill a glass of ‘water’ on it at one of your parties. Unfortunately, while the fabric finish looks stunning from a distance, it also attracts a lot of lint and particulates. Therefore, I’d advise you to position the speaker away from windows or out of the reach of your pets, if you have any. 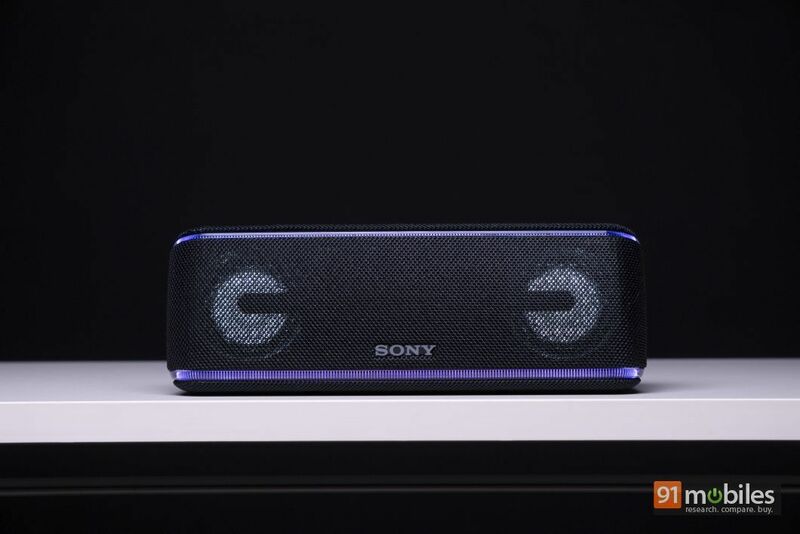 So, the Sony SRS-XB41 looks good, is tough and comes with fancy RGB which can set the mood even when the speaker is on mute. What else? Well, I’m glad you asked because the speaker comes with more ports and buttons than five MacBook Pros combined. The buttons are positioned at the top of the speaker whereas all the ports are housed inside a rubberised gasket towards the back of the unit. As far as the buttons are concerned, the speaker comes with a play/pause button which can be double or triple-tapped to skip to a different song, volume toggles and the Live Button (which I’ll recommend you never press). 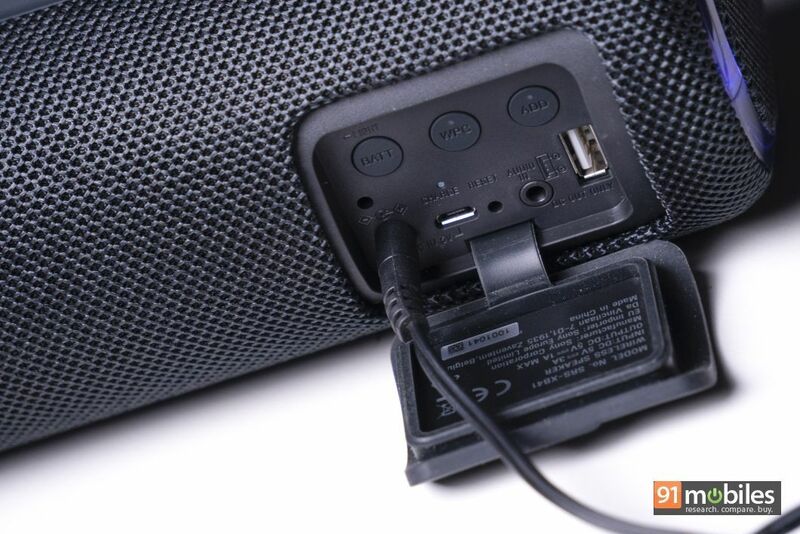 For ports, you’ll get a DC input as well as a micro-USB port to charge the speaker. 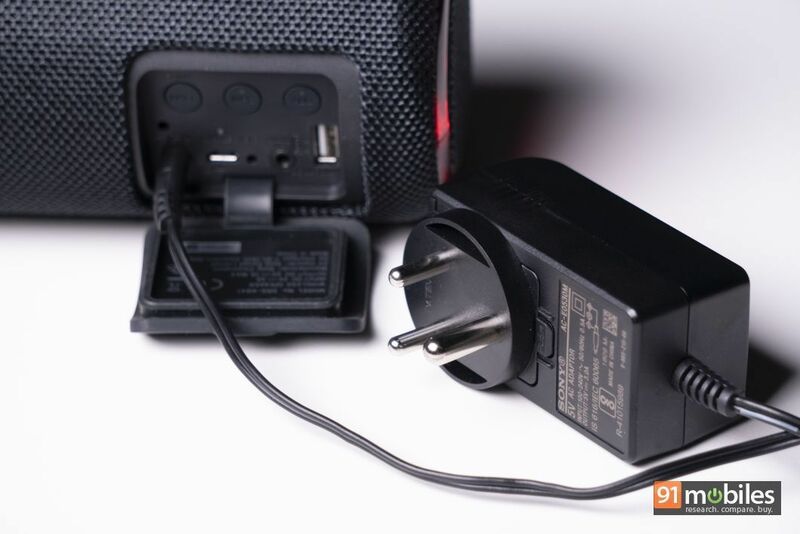 While carrying a micro-USB cable is more convenient than lugging a DC adapter in your bag, bear in mind that the latter will charge the speaker significantly faster. You’ll also get a full-sized USB port which can output some of the charge from the speaker to power your smartphones. Lastly, you’ll get three buttons inside the rubberised gasket too. The button labelled ‘BATT’ will tell you the amount of charge left on a short press and will switch off the LED lights when you hold it for a few seconds. The ‘WPC’ or Wireless Party Chain button will let you chain up to a 100 different Sony compatible speakers with your unit of the SRS-XB41. Lastly, the ‘Add’ button will allow you to pair two units of XB41 via Bluetooth and use the speakers as separate left and right stereo channels. The XB in Sony’s SRS-XB41 stands for ‘extra bass’ and sure enough, the speaker packs a hefty punch in the low-end. However, don’t let that fool you into thinking that the speaker is only designed to appease EDM-heads. On the contrary, the SRS-XB41 has a warm and rich sound which does justice to a variety of genres of music. But first, let’s talk specs. 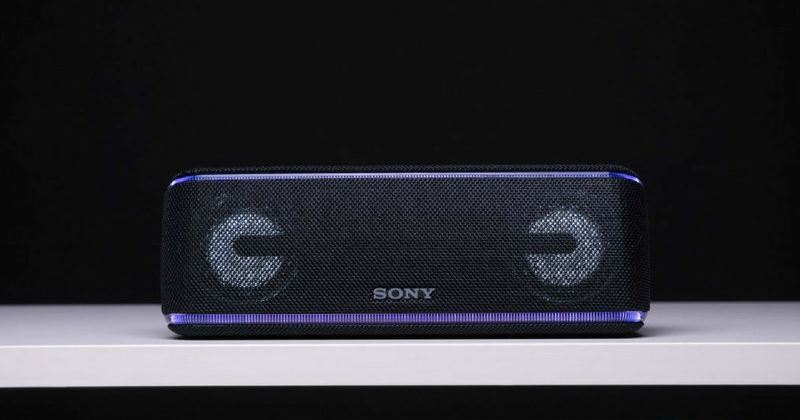 The Sony SRS-XB41 is backed by a pair of large 58mm speaker units. Unlike some other speakers in the market, the speaker cones on the SRS-XB41 make use of Mica Reinforced Cellular fibre (MRC) which is relatively more rigid than speaker cones constructed using paper. The use of MRC fibre ensures that the speaker cone doesn’t flex or lose its shape over time, which results in distorted audio. Technical mumbo jumbo aside, the SRS-XB41 is arguably the best-sounding speaker in its price range. As I mentioned previously, you get oodles of bass with the XB41 which will undoubtedly impress party-goers. I’ve been listening to a lot of Cardi B, and her latest single I Like It is a shining example of the SRS-XB41’s prowess in the low-end. The song starts with a beat drop which sounds fantastic coming out of the speaker as it’s tight and impactful. Turn the page over to 6LACK’s Getting’ Old and you’ll get a similar result – the kick drum has the intensity which can shake a room but even at max volume, there’s no noticeable bass-bleed. Now, you’d be wise to think that the bass overlaps with the mids at times, but you’ll have to take my word for it – it doesn’t take anything away from the listening experience. In Drake’s God’s Plan, you’ll be able to hear the vocals as well as the instruments used in the background just as clearly as the beats of the song. Surprisingly, for a bass-driven speaker, the XB41 is good enough to listen to guitar-heavy songs too. Even though the highs roll off and the tunes aren’t as intricate as I’d like them to be, I still enjoyed listening to artists like The Killers on the XB41. Sony claims that you can get a 24-hour battery backup with the XB41 which is far-fetched, to say the least. At best, you can squeeze around nine-ten hours of continuous music playback from the speaker and that’s with all the LED lights off. This is still a good number for a speaker of the XB41’s magnitude, but it’s not quite what the company claims. You can connect your smartphone to the SRS-XB41 speaker via Bluetooth or NFC and both pairing methods worked flawlessly during my testing. Moreover, if your smartphone boots Android Oreo, then you can also leverage Sony’s proprietary LDAC codec, which comes baked in with the latest delicacy of Android. Compared to other codecs, LDAC can transmit a lot more data over Bluetooth, allowing you to enjoy your favourite songs at the highest possible bitrate. Unfortunately, if you’re not on Android Oreo or are an iPhone user, then you’ll have to stay content with SBC / AAC codecs. During my stint with the speaker, I didn’t come across any connectivity issues and my unit of the SRS-XB41 maintained a rock-solid Bluetooth connection through and through. Unfortunately, the call clarity isn’t very good and you’ll have a lot of “could you repeat that” conversations with the XB41. 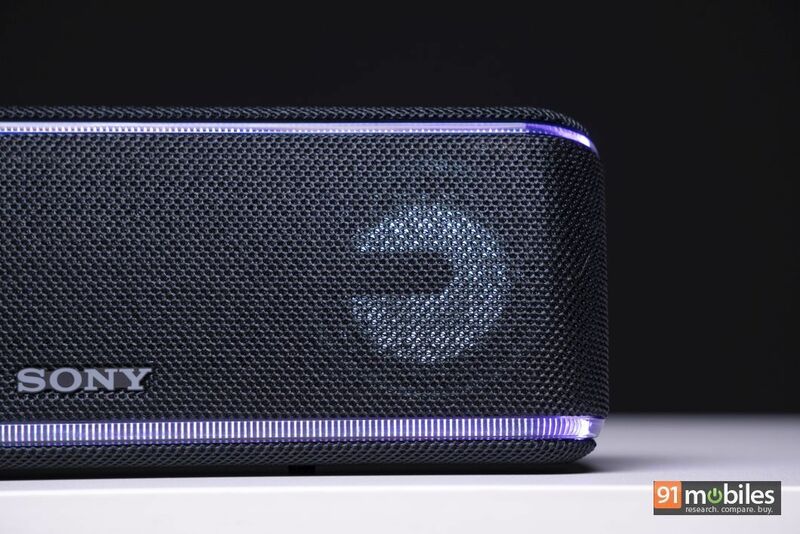 As of writing this review, the SRS-XB41 is available for purchase from Amazon for Rs 14,990, which at first glance, might seem like a lot of money for a Bluetooth speaker. But once you factor in the XB41’s outstanding sound quality, its robust build, and aesthetically stunning design, the speaker will come across as an absolute bargain. What’s more is that you get a ton of features with the speaker and a battery backup which will keep the party going till the sun goes down. Therefore, if you were on the fence about getting the SRS-XB41, rest assured, you won’t get a better speaker at this price.